Twenty years before Jamestown was founded, over 100 women, men, and children came to Virginia to try their luck at starting a colony. They arrived on the stormy shores of what we know now as North Carolina. They were not the first to land there. Two years before, another group of colonists, all men, gave up trying to settle Roanoke Island and sailed back to England. The supply ships arrived too late to save the abandoned first colony, but they left behind fifteen soldiers to mind the fort who soon vanished into the wilds, driven off by an Indian attack. That first colony had their problems with the local tribes, caused in part by English arrogance and made worse by a historic drought that led to hunger for all. By the time the second group of colonists came, the locals were not so welcoming. These settlers arrived in July of 1587 and soon laid eyes on the burned ruins of the first village. Roanoke Island was not their chosen destination, but their ship's captain would go no further, so they stayed on and rebuilt. Yet, they arrived too late to plant crops, and once again colonists had to rely on friendly Indians to help them survive. They had a strong supporter in Manteo, son of a local ruling queen, who had traveled to England with the survivors of the first colony. Virginia Dare was the first English child born in the Roanoke Colony, on August 18, 1587. She was only nine days old when her grandfather, Governor John White, left her and her young family, along with the other colonists, in their new home. He went back to England to get much-needed supplies, and he meant to be back quickly. Sadly, many factors including storms at sea and the war between the English and the Spanish kept him from returning for three years. When Governor White finally returned to his colony in 1590, he found it eerily deserted. No one, it seemed, had been there for some time. A sturdy, tall fort had been built where once there were simple houses. They found heavy bars of iron and trunks of supplies, once hidden, now dug up and destroyed. Bare footprints could also be seen in the sandy soil. Before he left them in 1587, Governor White arranged that should the colonists choose to leave the island, they would mark their destination on a tree. If they were in serious danger, they were to also carve a cross there. 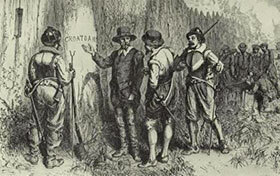 Indeed, upon careful investigation, Governor White did find the word CROATAN carved on a tree trunk. But, there was no cross to show that they were forced to flee for their lives. Croatan, the name of a friendly Indian tribe, would have been a logical place for them to get help if they believed they had been abandoned by their own people. The lost colonists of Roanoke were never truly found by Europeans, but some legends suggest that they were adopted by local tribes and eventually adapted to their ways of life. According to Sir Walter Raleigh, survivors were believed to be living in the Norfolk area of Virginia, not too far from Jamestown. But no proof was ever recovered. A new theory from anthropologist Lee Miller puts forth that, instead of going north and joining with a tribe of their own free will, the colonists headed west towards the mountains. Some were probably killed by more violent tribes, and others would have been sold into slavery. This would explain the sightings of European-looking natives in later years throughout Virginia and North Carolina. Yet another theory is that the Spanish, who were also trying to colonize the New World, destroyed Roanoke as they had other competing settlements. Whatever became of 115 Roanoke Island settlers remains a mystery to this day, but it is a mystery that archaeologists, historians, and others pursue in hopes of recovering the true and final story of the Lost Colony. The Lost Colony of Roanoke, by Edward F. Dolan. Young, independent readers will enjoy this 48-page history mystery. Includes maps and other illustrations. Part of Kaleidoscope's American History series. 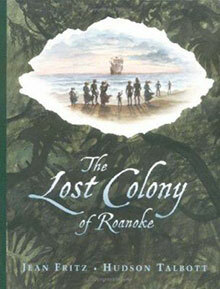 The Lost Colony of Roanoke, by Jean Fritz. Talented author Jean Fritz weaves history, hoaxes, and recent archaeological findings on the doomed colony into a fast-paced story. Roanoke: The Lost Colony by Brooke Coleman. This 24-page book is a good choice for younger readers. Includes a glossary, an index, and a list of useful Web sites. Also available online as an eBook. 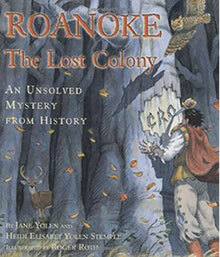 Roanoke The Lost Colony: An Unsolved Mystery from History by Jane Yolen. "The Unsolved Mystery from History series is written by acclaimed author Jane Yolen and former private investigator Heidi Elisabet Yolen Stemple. Read carefully and check your clues. You might be the first to solve a puzzle that has baffled people for years." Roanoke: The Mystery of the Lost Colony by Lee Miller. Describes the two failed attempts by English colonists to establish a settlement on Roanoke Island at the end of the sixteenth century. 112 pages. This author has also written a more extensive book for adults on the same subject, Roanoke: Solving the Mystery of the Lost Colony. Click here for other Roanoke books and videos in our adult collection. Includes "Roanoke Island: Fact and Fiction" and "Roanoke Island: The Lost Colony." You can ask the librarians at North Carolina's Government and Heritage Library questions on these pages. This site from the National Park Service breaks down the study of the Lost Colony into thematic units and includes related Web links for each. This booklet is intended for young readers in grades four through six. Some words and terms which may not be familiar are underlined in the story and explained in the section called "Some Neat Stuff." The information comes from the National Park Service, Fort Raleigh National Historic Site. 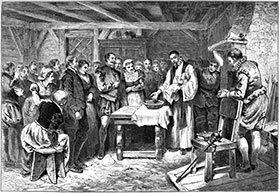 This brief article states the facts and explores the theories of the Lost Colony.